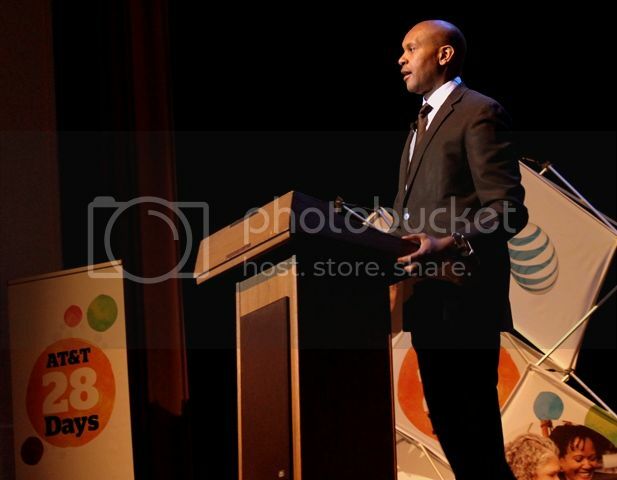 WASHINGTON, DC – On Thursday, February 7th at the historic Lincoln Theatre, AT&T kicked off its 28 Days campaign that aims to motivate consumers to take a forward look at Black History Month as they create their own history. Celebrating its fifth anniversary, AT&T 28 Days features a multi-city speaker series and concert tour with comedian and radio personality, Rickey Smiley serving as host. The free speaker series and concert tour blends together a roster of performers, thought leaders and innovators that are taking a forward look at making history. Also new for 2013, the campaign will showcase musical performances from R&B sensation, Elle Varner. Jennifer Jones, vice president of Diverse Markets, AT&T Mobility and Consumer Markets addresses the crowd. 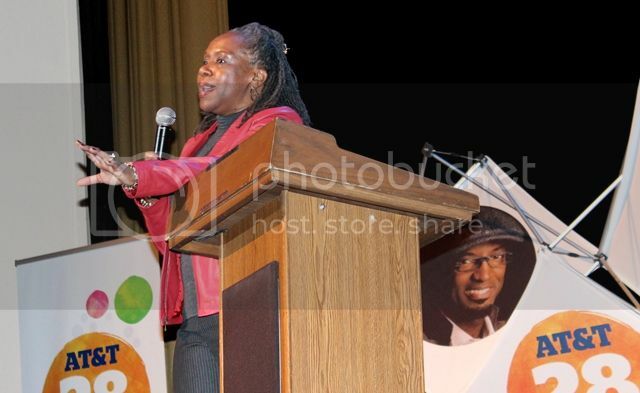 For the campaign’s first stop in the nation’s capital, the featured speaker was hip-hop commentator, activist and author Kevin Powell, who has dedicated his life to public service since the age of 18. BlackGivesBack caught up with Kevin while in DC to learn more about his community involvement and his organization, BK Nation. MC Lyte, hip-hop icon and pioneer female lyricist; Tabernacle Theater; Thursday, Feb. 21 in Atlanta, Ga.
Jeff Johnson, social activist and political commentator; Millennium Centre; Wednesday, Feb. 27 in Detroit, Mich. The speaker series events are free and open to the general public. Tickets are available at att.com/28days on a first come first serve basis. And as part of this year's campaign, AT&T has added a 28 Days to Inspire photo sharing contest at 28daystoinspire.com that allows consumers to submit and share photos of their inspirational moments for a chance to win a grand prize of $1,000 to purchase tickets to any Live Nation concert in the U.S. taking place in 2013, and $1,000 cash. On the website, consumers will be able to submit their photos through Facebook, Twitter and Instagram. The contest runs from January 21 and continues throughout the month of February. All submissions will be judged based on creativity, uniqueness and their relevance to Black History Month. Only one entry can be made per person. A complete list of contest rules can be found at att.com/28days.